Kashan Crewel Kit – Give-Away! Since we’re moving towards the beginning of September and autumn here in the northern hemisphere, it seems to me like a great time to think ahead to cooler weather and crewel embroidery. For some reason, I always classify crewel work as a cool-weather pursuit! Courtesy of Wooly Thread, which is a terrific US source for Appleton wool, wool felt, and Other Things Wooly, it’s time for a crewel embroidery kit give-away! The kit is called Kashan. Designed by Anne at Talliaferro Classic Needleart, Kashan is exclusively available through Wooly Thread, where you can find the whole kit (instructional packet, linen and threads) in two thread offerings – Appleton wools or Cascade House wools – or you can purchase just the instructions, or just the instructions and the wool… whatever configuration of the kit you’d like. I’ve reviewed several Talliaferro designs here on Needle ‘n Thread. If you’d like to see just how thorough the instructions are in these designs, you can take a look at my review of the Royal Persian Blossom kit, or La Serenissima, both of which will give you a close-up look at the instructional booklets for Talliaferro designs. Unlike previous Talliaferro designs, though, Kashan is a smaller project – under 10″ – but it is just as exuberant as the rest of them! There’s a lot of life in these crewel projects, just waiting to be released in color with wool threads as you stitch them up! Today’s give-away includes the instructional packet for Kashan, Strathaven linen for the ground fabric, and Cascade House threads. The project is suitable for beginners to crewel work and beyond, since the instructions are so thorough. I wouldn’t classify it as suitable to absolute beginners to hand embroidery, though. As long as you have some experience with stitching and transferring designs, along with a desire to indulge in some lively crewel embroidery, you’re good! If you’d like to join in on today’s give-away, please use the follow guidelines to join up! 1. Leave a comment below, on today’s article on Needle ‘n Thread. You can follow this link directly to the comment form. Comments sent in via email or left on other articles on Needle ‘n Thread are not eligible. 3. On the comment form in the “name” line or at the end of your comment, please include a recognizable name that won’t be confused too easily with similar names. For example, if your name is Sue, you might include your last initial or where you live (ex: Sue Z, or Sue in Syracuse). This helps avoid confusion when the winner is announced. 4. Comments must be submitted before 5:00 am, Monday, September 5 (Central Time – I’m in Kansas! ), and the winner will be announced that day. The winner will need to contact me with mailing information, so please keep an eye out for the announcement, in case it’s you! If you’d like to take a look at the different levels of Kashan kit offerings on Wooly Thread here. Remember, today’s give-away includes everything you need to complete the project, except needles, a hoop, and some scissors. So, if you’re hankering for a bright and lively crewel embroidery kit, join in the fun! Who knows? By the time mid-September gets here, you could be stitching away on your own Kashan embroidery kit! The type of embroidery I like best changes, as you have mentioned through the seasons and also with my own moods and feelings. If there is something on my mind I may choose work that does not require a lot of thinking or counting, other times I enjoy losing myself in the concentration of stitching. I have been fascinated by stumpwork recently. I like the architecture of it. I absolutely love crewel embroidery. I like the feel of the wool. My second favorite is surface embroidery. Silk is so nice to stich with. Would love to play with this new kit. This is a hard one to answer because I love all forms of embroidery. I’ll answer today by saying surface embroidery because I just finished a project that provided lots of creativity! My favourite form of needlework is whichever one I am working on at the moment! So, last week it was canvas work, this week it is penny rugs and next week it will be surface embroidery. lol If I had to chose one type though it would be crazy quilting because it allows you to incorporate most other forms of needlework in your embellishing. Thank you for this wonderful giveaway – Talliaferro designs and kits are high quality! I already have two of them and would like to add this one for its exuberant design and fabulous colors. From the beginning of my embroidery journey, it was crewel embroidery that attracted me with its wonderful designs, colors, and variety of stitches. I love variety in my stitching and crewel provides it. Goldwork… So beautiful and such a variety of things to work with. All the different metallic Threads, bits of metal, ways of padding and types of stitches. This is such a lovely kit. As I consider myself an overconfident beginner I like and stick with surface embroidery most of the time. Love the color and movement in these patterns. So beautiful! I love to do all kinds of embroidery, crewel, canvas embroidery, traditional needlepoint, gold work, etc. as you can see I have a lot of time now since I retired and I love pursuing my favorite thing. I love many kinds of embroidery but my current favorite is gold work. I keep meaning to get back into doing crewel work and I’m working on a silk gauze piece. thank you for your inspirational newsletter. I love surface embroidery using different types of threads because I adore the resulting richness of colors & texture I can create in surface embroidery. I prefer crewel for two reasons. The wool thread is larger than embroidery floss and with my vision issues-I still can be creative and see what I am doing! lol. Plus I love the vintage look of crewel. I just love doing a mix of embroidery stitches and beading on a piece. The one adds color and design, the beads add texture and a little sparkle. I love crewel embroidery. So challenging and relaxing at the same time. Great way to decorate my clothing and quilts. I love this, Mary! And I like the smaller less intimidating size! I started embroidery with my grandmother giving me stamped aprons to cross stitch, then I started crewel … Long before I knew about such techniques as white work or gold work or stump work or …. All of which I have tried and have loved. Crewel seemed to fall out of favour with some folks, but it has always been a mainstay for me. My favourite? Right now it’s surface embroidery (like your A monogram) but it could change with the weather! Thanks for the give away, and cheers. Even though I’ve done crewel work in the past, most recently I’ve worked on canvas and beading. My most favorite is canvas work with projects that have been kitted for me either by purchase or through seminars or workshops. These types of kits tell me what stitches with what threads go where but also allows me to change it as I’d like. And the geometrics to me are just pleasing to my eye. On the opposite note, however, this crewel project intrigues me to put my needle back to the wools again,,, what fun! Thanks for the chance to get back to a previous love!!! Whitework is my preference in doing needlework and Hardanger is my first love. The elegant beauty of white on white and the variety of stitches that can be used from the simple kloster blocks and other features of Hardanger create an heirloom worthy of many years of enjoyment. Finished projects can be small or large with many embellishments and still remain a wonder to behold. I also like the idea of not needing a hoop and working with one color thread. The needlework I love to do most is cross-stitch, followed by ethnic stitching, especially Estonian folk patterns, Rozashi, and Sashiko. I have recently enjoyed graphic needlepoint and gold work as well. I love crewel work, whitework but cross stitch is the embroidery type that relaxes me the most! I am a newbie to embroidery and am gathering an extensive library of books. Just love your blog and newsletter! And, I want to do ALL of it! What type of embroidery do you like best and why? i like surface embroidery best; the ones i design myself. i like making practical things pretty. love love your site. so interesting & informative. you help me discover how to use color and floss, thank you! I love to do pretty much all types of embroidery. The one I’m really into at the moment is counted canvaswork, but I’d definitely take a break from it to stitch this beauty of a kit. Once I saw Taliaferro reviewed by you and became aware of their amazing I was hooked, I just love the versatility of what you can do with them. I have not done crewel embroidery for years and would love this to be the first of many of their designs thst I complete. I am really getting into the Brazilian stitches, crazy quilting, just anything that is handwork. It is all rewarding and relaxing at the same time, but each presents it’s own challenges and rewards. From basic embroidery to lavish crewel. This crewel work is gorgeous. I enjoy reading all your articles, they have helped me learn new stitches and improve my work. My favourite type of embroidery is hard to choose. I hate cross stitch but everything else?? I suppose surface embroidery as it is so versatile and can be used anywhere, but I love Hardanger, Blackwork, Crewel, Goldwork I could go on for ever. I LOVE Embroidering!! I’ve been embroidering since I was eight when my grandmother started to teach my cousin and me, but my efforts have been limited to traditional and simple embroidery. I’ve made many embroidered dresses for my granddaughters and have embellished my clothes with embroidery, but would love to try this crewel embroidery as I’ve followed it with great interest on your website and from your emails. Thankyou for this opportunity. What a huge roller coaster life has brought you. I wish you all the very best and know that with your courage and fortitude good things will eventuate. A tough time, but may there be sunshine, rainbows and more gorgeous embroidery ahead for you. And for us too I hasten to add. I love your emails and often read them in the middle of the night when I can’t sleep. Kansas time must be opposite to Brisbane Aust time as they often arrive late at night. Hi, this kit is absolutely beautiful….and in some of my favorite colors! Although I have tried most types of embroidery, my favourites are Japanese (Bunka) and crewel. I would love to stitch this kit! I want to tell you how great your newsletters are….they are full of information, tips, beautiful pictures, and many ‘how tos’. Your stitching is exquisite! Newsletters take a lot of time and thought….I appreciate very much your hard work! Thank you. I’m very new to embroidery, crewel, etc but I was exposed to it as a child. I consider my mom a fiber artist, although I don’t think she’d ever say that about herself. From my earliest memories, she was always doing something with fabric, yarn, thread. Her love is crochet, and her passion is fine cotton. The crocheted clothes she makes are outstanding. But she also did embroidery, crewel, sewed clothes, etc. I remember her excitement when she’d start a new project. I still love the Christmas village scene she did in crewel. If I’m the lucky one, I would like to share this with my mom. I think she’d like it. I enjoy embroidering embellishments on items I make as well as cross stitch. I love this kit design. It is stunning!!! Thank you for hosting this giveaway! Darlene P.
My favorite type of embroidery is cross stitch. I love trying other forms of embroidery but I always find myself missing cross stitch and must dig out a new pattern or old unfinished project and get back to cross stitching! My favorite is probably crewel. This is beautiful! I Love all types of needlework. My favorite in counted thread on linen. I have done some crewel work also and like to work with it. I would love to have a chance to win this piece. I’ve never done crewel work, I love white work, but I’m a general surface embroidery kind of girl. I love all types of needlework. I have been stitching most of my life. I would love to have a crewel kit as I have not done crewel work in many years and would love to try it again. Hi Mary! What a beautiful kit. You have exquisite taste in embroidery and you are an infinite source of inspiration for me. I’ve been embroidering for only a year and I’ve discovered that I really love stumpwork. Especially the slips. It’s amazing to me to take a piece of floral wire and some floss and create a lovely flower or insect. So many lovely things to make. I also like long and short and, for fun, embroidering corny press-on designs to hang in my kitchen. I’m getting ready to try my hand at gold work and the little casket in the Cabinet of Curiosities class. I love surface embroidery. I find it a very relaxing hobby and am always excited to learn new stitches. I have been embroidering since I was five and have never grown bored with it. I love the kit that you are giving away and my fingers are itching to work on it! My favorite type of embroidery right now is crazy quilting. This helps me to do two of my favorite things together. My husband’s grandmother did crewel work and love watching her. Would love to give it a go. Right now I have been doing embroidery on stamped linen. I’ve enjoyed making my own choices on thread and stitches and that it is portable so I can take it with me when I travel. I’ve also done needlepoint and crewel work, which I have been unable to find recently. My favorite projects are often ones that have a variety of stitches and styles. I generally like both the execution and finished projects of projects that combine techniques. My favorite stitching to do is specialty stitches done on linen. Queen, satin, etc. I’ve done a little bit of crewel embroidery. Although it intimidates me a bit, when I’ve actually starting stitching it, I’ve done pretty good. This particular piece is so beautiful in my favorite colors. What a special treat it would be. Thank you for offering this. Pat T. in Kingston Springs Tennessee. As a child, I learned some surface embroidery. I loved it! and was so proud of my skills! But when counted cross stitch made its appearance, I became hooked on that. (I’m old-so that was 40-some years ago. )Counted work is so orderly, in a life that rarely is. Lately I’ve been thinking about crewel embroidery- so this kit would give me a wonderful start on that. I appreciate the opportunity to win this kit. I’m still learning all the different types and how they differ from each other so I don’t really have a favorite yet, I just know I love stitching! My first embroidery was crewel. My favorite now is embellishing my appliqué. But there is no embroidery I don’t love! 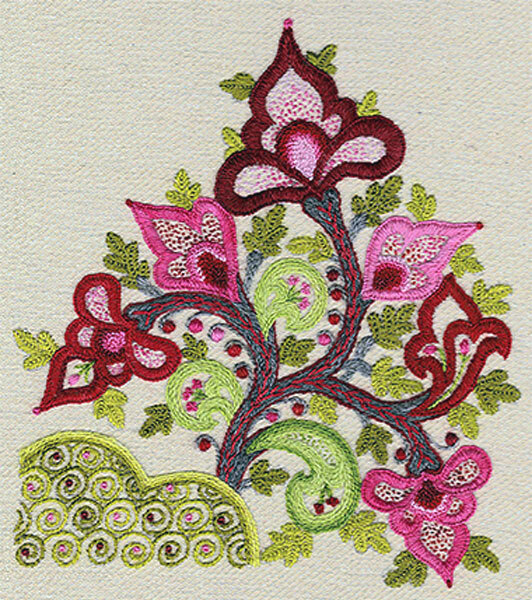 I love any kind of embroidery worked with vibrant colours, and this kit fits the bill. Crewel is a favourite because of the texture: you can see it and feel it. All in all, embroidery is a very sensual art form. I didnt realize until recently, that the kind of embroidery I like to do, is categorized as surface embroidery. Within that category I like crewel, all kinds of white work and stump work . I did crewel work years ago and would love to get back into it. This kit is beautiful! I do a lot of wool applique. I have just started to embellish my projects with embroidery. I enjoy this immensely and love the way the embroidery makes simple designs pop! I experimented with crewel embroidery as a teen. I am now more then ready to revisit this! Well, well I do practice so many different form of embroidery (blackwork, cross stitch, sashiko, crewel, surface embroidery, whitework …) that it’s a bit hard to say ! However I still prefert all kind of surface embroidery, where I included Crewel and Whitework, as it offers so much variation in stitches … I’m never bored with it ! Moreover as I don’t know all the stitches available in this art, I’m still learning so much years after start time when I was a child. I love embroidery and love straight stichs, but I am not too good at it, I cross stich a lot because it is much easier but embroidery look so much nicer and I learn with your site that some of the stichs are not too hard. Thank you for the opportunity. I love the surface embroidery on crazy quilting because it gives me an opportunity to try all sorts of stitches and techniques. But I want to try crewel work again some time in the future – I did a small piece many years ago. I learned to love embroidery by looking at finished crewel pieces. My favorite type of needlework are blackwork, cross stitch, and surface work. I love to look at finished projects in all types of handwork to get ideas for what to try next. The colors in this project you are offering are some of my favorites. My needlework experience is pretty limited in variety but I enjoy cross stitch, counted canvas, and Hardanger. I would like to try frewel so was excited to see this beautiful kit is suitable for beginners. Thanks for offering such fun give-aways! I am pretty thrilled with any embroidery work but I am best at general surface and cross stitch. Thank you for all the information…the links were great. Would love to get back to hand embroidery more as it is being used more in quilting….thanks for your videos I really need the lessons…. My favorite is crewel work because of the multitude of stitches and colors that can be used. It’s absolutely fascinating to me. Crewel work takes me back in time to embroidery with my Grandmother. These new kits are a wonderful update with thoughts of mystical holidays in far flung places. I love embroidery! Crewel work for its colours design and history, blackwork for its ability to lose you in a pattern and the sheer pleasure of watching your work change with the thickness of thread expecially if you are twisting your own, white work for pure elegance, Japanese (although I am only at phase four) for discipline and technique, goldwork especially with silk shading. I love the look and feel, the colours, the theraputc pleasure of losing youself in threads. I love the journey that embroidery takes you and the calm it brings to a hectic day. I love to work on surface embroidery and try new stitches and designs in and around the original pattern, usually using 2 strands. Very relaxing while watching TV in the evening. Would like to try this crewel kit very much. Never too old to learn. Hope you pick me! E…ALL OF THE ABOVE!!! The only one I have yet to try is goldwork. Currently I’m doing some “freestyle/abstract” surface embroidery work. Surface Embroidery!! Love, love it. My favorite thing to do is experiment on fabrics I haven’t embroidered on before. So enjoy the variety of stitches and fibers involved with crewel work too. Needle Painting…..freedom in form…Love being able to put a stitch in where I want to…it’s like coloring inside the lines….using all types of threads “yes”…. What type of embroidery do you like best and why? I confess: I am a counted cross stitcher. I love the symmetry, the preciseness, the colors, the patterns. I like the math in it. And, yes, it satisfies my latent OCD tendencies! I enjoy all kinds of needlework but my favorites are any kind of counted stitching. I haven’t done much crewel work so would love to do more. What a wonderful crewel kit. I enjoy all stitched but find my favorite is the project I am working at the time (until I start a new one). I haven’t done much crewel work lately but I remember the first project that got me hooked in stitching was crewel. I really love white work, I have never tried crewel work but would love to try. In general I love embroidery, it calms and brings a a serenity to my busy life. I love the way any kind of hand embroidery progresses from something unrecognizable to a completed wonder-amazing! My favorite has to be hardanger, beautiful when finished & so much easier than it looks! Thank you for such a great giveaway-Susan in Mississippi. I love all kinds of embroidery but cross stitch is the one I love most. But for this design, I like to try to make it because it looks easy to embroider. Haven’t worked anything in crewel in a very long time – more than 40 years. Your comment about crewel being a cool weather project is so right. makes me think about a change from my typical obsession with cross stitch and surface embroidery with cotton. Perhaps wool and needles are in my future. I love crewel work and this is a really pretty kit. I like all types of stitching but crewel was always my first choice when deciding on projects. Although I love all types of embroidery, my favorite is crewel. Thank you for this giveaway, and for your wonderful blog. I love projects that are colorful and have different stitches, that have some degree of difficulty so that I can be a little challenged. Cross stitch is so boring to me, doing the same stitch over and over. I do like to do different types of embroidery from time to time. I love Crewel work! Crewel work is the first type of embroidery that I learn from my grandmother and mother. The feel of the wool reminds my of those days. My favorite will always be Crewel work. Thank you for the opportunity, it is a lovely kit. I’m a newbie to the craft, I have done some embroidery on my penny rugs and I’m currently working on a scissor case that is a stitch sampler. I’m enjoying trying out all the stitches…..so my favorite right now! I admire all forms of embroidery…I am not very experienced at any of them, so I have lots of room for improvement. I like the flexibility of surface embroidery, so I would say that is my favorite…any skills using surface embroidery can be refined by a choice of materials-a quick trip through Pinterest shows how creative stitchers can be. That being said; I would love to complete a Crewel project to honor my grandmother, a talented stitcher, who completed many crewel projects. I enjoy crewel and surface embroidery. I like to work on very detailed projects. Cross stitch was my choice in the 80’s and then I stopped needlework when my eyesight went through the middle age change. Recently my daughter asked me to teach surface embroidery to her home school co-op so I have been reviewing your videos to hone my skills. I would love to win this project to work on during these upcoming winter months! Like you, I tend to like different types of embroidery depending on the season. I like to work with wool in the fall and winter; and I pursue more gold work and needle painting in the summer. All of it makes me happy! I like general embroidery the most. The wide variety of stitches fascinate me. I’d love to try my hand a crewel work. I love to do cross-stitch as I love to see the blank piece of material come to life as I stitch. I like to use the different threads that are available to us now compared to years ago. Sometimes it is hard to resist starting a new project before the last one is done because I want to try some new thread and see how it works up. Hi, thanks for this opportunity to win this embroidery kit. I really like surface and crewel embroidery and love your website. years! When I was in my 20’s and 30’s ( I am in my 70’s now)I enjoyed working with and making lovely thread pictures. I have a clock in my bedroom that I embroidered for my mom many years ago. My husband and I were just starting out in those days and money was short. I remember using just any yarn I could find—not necessarily crewel—and using it! I,embroidered a pillow top with thatn”wrong” yarn and won a ribnon at county fair . Also I embroidered some curtains with that yarn! Lately I have not been doing crewel but would much like to do it agsin–with the “proper” yarn. I havpe been doing some surface embroidery lately and really like the new Sulky embroidery thread. I love all kinds of embroidery. At the moment needle painting. I love Crewel embroidery because of the variety of stitches and colors. While this can be said of most embroidery, the stitches’ texture really draw me in. Lately I have been into redwork (although my color of preference is a dark blue) and counted cross stitch also remains a favorite. I learn a lot from your site and would love to expand my stitching knowledge. I have always loved crewel embroidery. The graceful designs and color combinations of crewel work appeal to me.Thank you for this opportunity to win this kit! I’ve done rework for years & other general surface embroidery & really want to spread my wings & venture out into more complex stitching this would be the perfect opportunity for me to try something new. I have recently found hand embroidery again, after several years of forgetting it! I have many types hanging out around the house. Many more given as gifts. My cross stitch kits overflow in my hiding place! Maybe one day! Crewel seems to go by quickly for me so I enjoy doing it. Thanks for your instructions as they have started me on my recent trip back to hand embroidery! I love surface embroidery. Although I’ve been at it for years, I still consider myself a novice. There’s so much to learn and experiment with! I have only done surface and Brazilian embroidery so far but I want to try more types in the future. I enjoy both equally, it just depends on what I am making. I would love to try out crewel embroidery and kits are a wonderful way to learn a new skill. I like cross-stitch the best, simply because I am very proficient at it. I’m learning (and Loving) general surface embroidery as well. Trish H in Cincinnati. I do enjoy crewel embroidery although I’ve not done a lot of it–I love the colors and design in this giveaway, though. Thank you for the opportunity! I’m a relative newbie to embroidery–I’ve been doing it a couple of years but haven’t done anything really challenging yet. I love playing with a wide variety of threads and doing funky free-form stuff, but I’ve found following patterns is a great way to learn and practice my stitches. Thanks for your work on this blog–it’s extremely useful! My favorite is cross stitch, though I am having fun learning new embroidery stitches. I have never done crewel work but would love to try it. I have done a lot of cross stitch and have just started in the past few years improving my general surface embroidery techniques. I started the Secret Garden project and love it. Because of my age and increasing back problems I am dismantling my vegetable garden and looking forward to new “hand work” projects this winter. My favorite technique is the one I’m working on at the time……. Such a difficult question! I have to choose two: crazy quilting and crewel. Thanks for the opportunity to try for this great giveaway!! I grew up doing cross stitch and crewel work and since joining the local EGA chapter, am now fascinated with new techniques such as huck, hardanger, bargello. But I would still pick cross stitch. I like to do Or Nué. Today I have embroidered my moon face book mark in Or Nué and the silver threads shines so beautiful though the silk surfaces. It’s best to describe me as someone new to embroidery. I am a quilter who is broadening my horizon by including embroidery in my work and making it more Quilting Art. I would like to master the skill to some degree so that when I have the opportunity I can share with friends, family and hopefully, one day with grandchildren. I have become quite taken with Norwegian Hardanger. There is so much beauty in the stitching and cut work. I like any type of counted thread work best with surface embroidery a close second. Surface embroidery is my first love. I learned it as a child. My Mom did crewel work and now I would like to try my hand at it. I adore the texture and depth of crewel work, and the jewel tones of this kit are exactly up my alley. I hope to have the opportunity to enjoy another one of these wonderful kits! Well, I would put myself in the beginners category, thus I have only tried surface and whitework. Would love to try crewel, this is a beautiful kit. I enjoy many kinds of embroidery…crewel, stumpwork, silk surface embroidery. I tried many different types of embroidery and crewel was one of my favorite ones. Especially in winter. In summer I like something not so warm. But as autumn is near, just few days ago I started thinking about the Royal Persian Blossom. But this new pattern also looks great. I love all patterns from Talliaferro and would like to have them all stitched. I really enjoy surface embroidery. I find that the slow rhythmic movements are relaxing. Hand work reminds me of simpler times and we all need something simple in our lives. Greetings! At age 60 i am just embarking on the embroidery path and totally smitten already. I’ve done a little ribbon work and learning my basic stitches and crewel is next on my list to try. I have been reading your daily newsletter for a while now, I really want to get more involved in embroidery. I have enjoyed cross stitch and am now stitching on wool from Sue Spargo books! My mom used to do crewel work, I have one of her pieces in my quilting studio wall! General surface embroidery at this point. I’ve done some basic stitchwork and chicken scratch. This is so beautiful! Thank you for loving stitchwork so much and for sharing ideas and concepts. You are a gem. I love all forms of embroidery. But if I had to choose just one it would be thread painting. Presently I am doing general surface embroidery. I am working up my courage to try stump work. I like many forms of stitchery, but the designs and colors of Crewel work really ‘call’ me. I love this kit as it is full of life and in my favorite colors. I love Crewel Embroidery the best. But I also do general surface embroidery with dmc or silk threads. I have done ribbon embroidery for crazy quilt pieces and added beads. I love that this art form is portable. It is relaxing and I can be creative in my efforts. It has been a 50+ yr love affair starting as a child.At some point would like to try goldwork. Thank you for your posts. Thanks for the contest. Beautiful piece. I can’t decide what I like best! I’m trying several different types. I love both the simplicity (straight stitches) and complexity (intricate patterns) of blackwork, but I’m also loving my newest venture into needlepainting. Crewel is one I haven’t tried and it’s on my to do list! What a classic technique–and this kit is absolutely gorgeous. I have to have it! Crewel embroidery feeds my soul and heart. It is my favorite form of needlework. I started doing embroidery about 50 years ago and a crewel work was my first piece. Being born in England I tend to always return to Jacobean crewel pieces. I would say, it’s in my blood. Since then I have continued to do crewel work (even when it wasn’t “fashionable”), needlepoint, cross-stitch and surface embroidery. I see the beautiful shades of pinks and greens in this crewel piece and would love to do it. As long as I have a needle in my hand I’m happy! I love hand work, I was thought basic embroidery as a child by my mother. I’ve done some crewel work in the past and enjoyed it very much. Right now I’m working on crazy quilting, I enjoy all the different stitches and beading work involved. Thank you for the opportunity to win this kit. Surface embroidery with lots of stitch variation is my favorite! I love all embroidery projects, but I have a special place in my heart for stump work. I love the historical approach to needlework and I’m currently working on Thistle Threads glittering nightcap project. So exciting! Love everything you do Mary -thank you – your posts always brighten my day. This is such a beautiful project! I decided to do an embroidery project for my children for Chistmas. Right now I’m doing a cross stitch garden for my gardener, and this is perfect for my city dweller. I love all needle crafts, but probably my favorite is crewel. I love surface embroidery.I love that I can use what ever stitch I want when and where I want. Also that it can be used on so many things. Especially red work. However have been trying new things and have just started Brazilian. Crewel is definitely on my list! I love needlepoint the best with cross stitch a close second. I think surface embroidery is about to sneak it’s way into my heart! Could I be fickle? I love all kinds of surface embroidery. Crewel is great because you can use so many colors and kinds of stitches. One of my favorite projects in the past was an embroidery I designed myself, based on the stitches and figures in the Bayeux Tapestry. It was fun! I tend to stick to surface embroidery, with french knots being my favorite stitch. There’s something very meditative about them for me. I haven’t dealt with crewel embroidery much so this would be a great chance to give it a go! I’ve been doing counted cross stitch exclusively of late. It would be so much fun and a bit of a challenge to do some crewel work again. Honestly, I love all types of embroidery. Each piece is always exciting for me. Hard to think fall is right around the corner, since I live in Florida. Sitting in my chair while working on a wool crewel project will put me right in the mood of the season. I would love to win such a beautiful kit. Hard to pick one and like others have said its whatever takes my fancy at the time which means right now Iam rather drawn to whitework and have just purchased a kit from Jenny Adin Christie for a rather gorgeous thistle design. Just getting up the courage to try it now! I have not tried crewel work yet. My mom, sister, and I have each started an embroidery book to use the different techniques in a self expressed memory style. Being a newbie, I am looking forward to trying it out. We have been amazed by the depth and width of different styles from countries all over the world.. Thank you for being a source of inspiration! My first love in the embroidery world is goldwork because it tends to be a bit different and not seen quite as much as other types of embroidery, but would love to have the opportunity of trying crewel work. I have done a beginners course but didn’t really like the subject matter as it was quite old-fashioned but this design appears to be more modern. Crewel Embroidery is my favorite. I love the colors that remind me of Fall, my favorite season. I just love crewel work, the colours, the textures and what story each piece could tell. It’s just magical. My first love is counted cross stitch and I always end up going back to it as it is very meditative for me. I’m also working through a Ukranian Whitework project called Grace designed by Terri Bay. This was a class I took at EGA GPR regional seminar in Eugene, OR in June. I’m in love with the play of the light and shadow off of the white threads and I think I’ve found another embroidery technique to love. Mary, this is a very generous give-away from Wooly Thread. I love the colors in this design and it looks like it would be fun and interesting to stitch. Love crewel work as it satisfies all my creative urges. I have not been doing any embroidery lately, but now as it gets cooler it is time to start again. Hello Mary! The crewel pattern is lovely! My favorite embroidery, however, is Brazilian dimensional embroidery! I fell in love with the vibrant rayon threads and stunning flowers using those threads, that it is my primary embroidery medium. Thank you for the opportunity to try a different style of embroidery though! Love the Jacobean patterns & the colors used here are wonderful. I love general surface embroidery best. Using DMC floss, perle, linen, etc. But crewel designs are so gorgeous and the texture of the wool is lovely. I may be converting over to crewel. Gosh. What a difficult question. I am fairly new to embroidery so still on my journey of discovery. So far I love everything I have come across but really enjoy working with silk threads in very fine surface embroidery. I have found it so therapeutic and rewarding. I have been retired a year and Have found the patience I didn’t think I had when I am working with lovely threads and designs. I have’nt done much embroidery work for some years, but would love to get back to my favourite of crewel work with this beautiful kit. This gorgeous kit sparked a renewed interest & appreciation for crewel! If it involves holding a needle and beautiful thread I’m game. Do I need to answer “why”? Just because I can! I’ve only done the felt Christmas stocking kits from Bucilla and would love to try something new and different. Although I enjoy different types of embroidery,Crewel work is still my favorite – I enjoy embroidering the different stitches. I like the old fashioned pillow case embroidery my grandmother taught me 40 years ago. Thanks Mamma for teaching me something I would enjoy all my life. I am currently working on a beaded design that will become a bag but I like and have done all sorts of embroidery. What I am working on depends on the weather and the amount of concentration I have. I find crewel work very satisfying. It goes a bit faster than the finer work, the colors are rich and the yarn soft. I really enjoy combining stitches, threads, beads and techniques in a single design. I thank you so much for your wonderful articles on your blog. I have learned so much from you. I so admire crewel work and have not done a whole lot of it. I seem to do mostly surface embroidery and would very much enjoy doing a wool crewel piece. I actually love all types of embroidery. But if I had to pick just one it would be surface embroidery. Thank you for the give-away! You always do such nice things! WOW! What a lively little picture. Love the “hot’ colors. I have recently gotten hooked on doing surface embroidery with silk or floss. Great fun! Would love the chance to include this crewel kit in my surface adventures. My favourite changes. I love working with wool, it comes up quickly and is forgiving for shading but recently I have been working on stumpwork and I love some sparkle from metal threads! My favorite embroidery is surface. Since I found your web site a year or so ago, embroidery is my new best friend in needlework. Thank you for sharing your talent and all the time spent on the videos it is very much appreciated. I hope you are doing well. I think of you often. I like counted cross stitch better than printed because it looks neater and the X’s are more uniform. I really love all kinds of embroidery, it all depends on my mood and the atmosphere outside. I really love the Crewel wool, which is my all time favorite. The look of it and the history of it intrigues me. I do love the looks of all kinds of threads too. Threads are just so beautiful and all kinds of them to choose from…So like I said I really like them all! Thank you for a chance to win a beauty! I have always loved crewel embroidery. This kit looks fabulous. I have just discovered crewel embroidery this past year and i love it. My favorite is surface work. I love the finesse of placing the stitches and watching a piece of beauty emerge. Although I have only worked with cotton, I am eager to use silk – I imagine the luxury would be 10 fold! Hi Mary, My favorite is cross stitch. I have done hundreds of pictures in my life and given most away. I love surface embroidery as well. The last couple years I have really got into it. Love it so much. My favorite type of embroidery is what ever I am presently stitching. I love trying new forms of embroidery but I do like the white works. There is something elegant about them. I don’t care for cross stitch. I want to just sit and stitch not consult a pattern every few stitches!! Which do I like best, or which do I like stitching best? Because blackwork is probably my favorite style of embroidery, but I’m fair-to-middling at it, skill-wise. When it comes to doing actual stitching, my favorite is your general free-style/surface embroidery. You know what I mean! (Humor me and tell me you know what I mean.) I’m still working on a piece inspired by the Hungarian tablerunner, using mostly stem stitch and braided chain, and every time I get some time to work on it, I’m happily surprised by how much I love doing these simple stitches. Thank you for another fabulous giveaway, Mary! What type of embroidery do I like the best and why? Probably Brazilian Embroidery , mostly because that is the type of embroidery of which I am most familiar. I really like counted work too, as I find the counted work meditative. I use my BE fir ask types of needlework. I would love to give Crewel a try again. It is what I did as a teenager. I love the red work best because it reminds me of my grandmothers. I must admit I love them all – especially whatever it is that I’ve researched most recently. I’ve tried goldwork (and love it), modern crewel is what I’m into at the moment and I am reading a lot about stumpwork, I’ve never tried true crewel with wools though so would love to win this kit. I find myself coveting a kit from the Talliaferro collection. There is not a type of embroidery that has not been a joy to do. There is something about the feel of threads and seeing designs come to life that give me peace. I have always loved crewel. There is something in the richness of the design and interplay of the colors that really appeals to me. Although I often do other forms of needlework, I always return to crewel. Thanks for this opportunity! I love thread painting embroidery. I also love surface embroidery and crewel embroidery. It’s hard to pick an absolute favorite since I enjoy switching between these types of stitching and using a variety of threads. What a lovely vibrant kit. I enjoy all sorts of embroidery, I usually have several different projects on the go so that I can embroider what I feel like each day! You can never have too many!! I started with cross-stitch and recently added other types of embroidery. My favorite type of embroidery is the type of my current project! Next on my list to try is whitework. I feel so lucky to live in the SF Bay Area because the SF School of Needlework and Design just opened and I can hardly wait to try all of their classes! I haven’t done lots of embroidery but have done hardanger. Love the white on white and the cutwork. Crewel has always been very interesting to me. Thank you for your website. I visit frequently. It is a great gift. Oh how I would love this crewel kit. I have not worked on a crewel project for many years. I love your website and how it reintroduces me to styles from years ago. My favorite current projects are wild (free design) embroidery on felt. It is so forgiving and I don’t worry about the threads on the back showing through. They are quick and make great gifts when I turn them into bookmarks, phone cases and the like. What kind of needlework do I like best and why? I haven’t personally worked very many kinds, but find I like surface embroidery because I’ve done that kind. I plan on trying my hand at the other kinds eventually in my lifetime. I haven’t done any crewel as of yet. T hank you for the opportunity to possibly win this kit. Susan H on the east side of Washington state. I learned embroidery as a child from my grandmother. Later I did a few crewel pieces and even later cross stitch. I love the details that can be brought out n cross stitch but my eyes are a little old for that type of work. I recently retired and found your web sight as I was looking for a crewel piece and ideas for pillows. I love your web sight and especially love the links to designer pieces. Thanks! I like general surface embroidery as I like to add embellishment to clothes, bags, quilts, etc. I enjoy needlepoint, cross stitch, and I would like to start counted needlepoint canvas work someday. My favorite designer right now is Chatelaine by Martina Rosenberg. I love a types of embroidery. Some I wouldn’t tackle, just admire. Cross stitch, ribbon and surface embroidery are my favorites. Crewel is probably my favorite, but I love whitework as well, and I do mostly general surface embroidery, as I am just getting back into the work. This is such a lovely kit – colors, shapes – and it is at a level that I think will challenge me just enough to push my old skills back into active play again! I have been wanting to do a crewel piece for a loooooong time. I stitched one many years ago but at that time the colors were boring. I can’t find it around the house so I assume I gave it away or it is tucked away in a trunk somewhere since it was not my favorite piece. I really am in love with general surface embroidery. I started off exploring crewel work and then gold work and then really anything I could get my hands on. At this point I just have to admit I don’t focus well and that I love it all! I love crewel embroidery. I’ve been on a kick for the past year or so, and I don’t see it ending anytime soon! Thank you for linking to more beautiful designs! Love all types of embroidery. But, some of my favorites are crewel, redwork and cross stitch. I like surface work; I feel like I can do anything with it. But then I haven’t tried much else, so that could change. I used to dislike cross-stitch, until I recently saw some lovely Bedouin cross-stitch, and the same thing could happen with other forms of embroidery. I like general surface embroidery but have always wanted to do more crewel work. I love surface embroidery, needle painting, and crewel work. I love to working with the wool. I would love doing this lovely kit. I like surface work, but crewel is so beautiful that I’d like to do more. This design is so elegant, I can see it on a few things I love! love the colors they look very rich. My favorite changes all the time. Just depends what I am working on – silk ribbon, cross stitch, surface embroidery, Brazilian. I love it all. Have never done crewel, but would love to try. What better way to jump in than by winning a kit! My first love is petit point. It is so delicate and precise. Who knows? Crewel could just become my new passion! Thanks for the opportunity to win the Kashan crewel kit. Crewel is by far my favorite embroidery form. I love the textures and relief of the stitches, the color shading and softness of the threads, and the classic Jacobean style. Crewel is what drew me to embroidery in the first place. Thanks, again, for this great giveaway! To be perfectly honest I don’t know the differnce between the kinds of embroidery, but I am good at embroidering and would love to make this. Thanks for the chance to win. I love the look and feel of crewel work. The shapes and colors are so warm feeling and inviting. I have done many different techniques over the years on all kinds of fabrics. My favorites – Brazilian Embroidery, Needlepoint and Crewel. I will often do a crewel pattern in wool and then repeat it in Brazilian threads. Luscious. I prefer general embroidery, but like everything and love to try new things. I have not done crewel in some time but have been thinking of doing it again. Hope this finds you feeling better, I enjoy your posts and have read them from first to last. My favorite now is counted cross stitch but lately I am shifting back to embroidery especially crewel embroidery. When I was in my teens, I was pretty good at crewel embroidery. There are few embroidery techniques that I dislike which makes naming one favorite difficult. Whitework covers an abundance of styles and variety, and some of my favorite pieces have been whitework. Blackwork with its multitude of patterns presents interesting challenges as well. I like surface design the best although it’s hard to pick one. Why? Surface design let’s me play with design alternatives of all kinds, freeing the creativity in me as well as giving me something wonderful to start with as well as lots of color. I can embellish all sorts of articles with surface design also and enjoy both the article and the additional design. Forgot to say how much I enjoy the articles on switcher of all kinds. Very motivating. Stitch more, stitch more, there’s so much to do and enjoy. Forty plus years ago when I gave up the nasty habit of smoking, I took up needlework – mostly crewel work and needlepoint. Since then, crewel work has been my go-to medium for handwork. The designs and stitches have plenty of challenges to keep me focused and enjoying the process. This is a wonderful give-away. Thanks so much for making it available to us. I love all types of surface stitching. This is a beautiful design and it would look lovely on the denim shirt I am embellishing. I like crewel work, but I love white work or “ton-sur-ton”. Thanks to Wool Threads and to you Mary, of course! Like others here, what type of embroidery I like varies, but I think I like general surface embroidery best. I love blackwork too. I’ve recently taken an interest in stumpwork. I haven’t done crewel embroidery in years but I’d like to try it again. Love it! Definitely my colors! I like using embroidery to embellish quilting with general surface embroidery. I’d like to learn more. I like al kind of embroidery. A needle, a piece of cloth and some thread make me very happy. I seem to have periods of doing one technique and then switching to another. At the moment I am working on some needlepainting, and my next project will be crewel. Thank you for letting us all in this give away! I especially like canvas work, surface embroidery, crewel and white work. I haven’t done any crewel work in many years and have been wanting to get back into it. I mostly do surface embroidery, although I’ve done a little bit of crewel and really enjoy it. I love mostly being very free with my embroidery. I love all types of needlework/embroidery, but my favorite is counted thread in silk. That said, I have recently become very fond of crewel embroidery. I tried it because of some of your recommendations, Mary! I find crewel to be very relaxing and a great choice when I’m feeling a bit tired and less focused! I would say general surface embroidery is my favorite. To me, it seems like the foundation of the other sorts of embroidery, laying the groundwork for other adventures. My favorite is crewel work. It’ was a Jacobian crewel work design that first caused me to try embroidery. I love touching the wool and the textures that can be created with it! Thanks Mary for a great blog and this opportunity for a generous give-away! I love to do surface embroidery because it is so versatile. I enjoy the dimensional aspect of crewel. The kit is beautiful! I really enjoy needlepainting and crewel work the most. But penny rugs are pretty nice, too. Thanks for the giveaway! I have not yet tried the Crewel embroidery. I love the detailed look of the piece pictured in the email. Such lovely colors, some of which are my favorites!!! I would love for this to be my first to try! My favorite type of embroidery to do is simply the basic ones you have on your site. Not sure what they are “called”. I pick “patterns” from photographs I see and trace the parts that I find lovely to just look at. When the coloring books came out I got some and traced quite a few from them and made some wonderful pieces that way. A few months later, you started your projects! Great minds think alike! I’m hooked on making my own patterns from others. Out of all this, I would absolutely love to learn a new type of embroidery! I used to love cross stitch (and still enjoy it time to time) but this site gave me the confidence to try surface embroidery. I love watching the videos here and trying out new stitches. 🙂 I’ve never tried crewel before, so this would be an exciting opportunity to do that. You ask such hard questions! Here I am trying to pin down which kind of embroidery I like best, and it’s like when somebody asks “What is your favorite book?” Today I am choosing crewel, which I may have chosen in the past in the same sort of situation. There is a lot of leeway with crewel. You can fool around with different colors, stitches, designs, projects and materials. There is an element of creativity available that is not necessarily there with some other forms of needlework. I love most types of embroidery. I tend to do cross stitch, surface embroidery and needlepoint amongst others. I have only dabbled once into crewel work up to now and really enjoyed the process. I think this kit looks fabulous and would enjoy working it. Many thanks for the chance to win it. I love the bright colors and elegant design of this piece. I love ALL embroidery! So, it is hard to choose an absolute favourite. I’ve.just got back in to crewel work again, but then there is cross stitch, gold work – but ok! I think I would choose my favourite of the moment to be stump work. All those gorgeous threads easing through you fingers as they stitch a 3D design and the relaxing calm that descends as you stitch. Yes… I do so love to stitch. Then there are Bullion Knots…..Oh, I could ramble on for ages……. I like best the general surface embroidery, because I feel free, and it gives me satisfaction. I really love surface embroidery, especially experimenting with different textures. After reading your hummingbird project I bought both the garden and forest colouring books. Only one problem, how on earth do I decide which of these beautiful pictures to embroider first? Many thanks for the introduction. I like to thread a needle, hoop some cloth, and see what happens! I’m currently enjoying “Thread paintIng”. Love the precision involved in color blending and the sense of depth and reality it can give to my projects. I like embroidery using special stitches like lazy daisy, French knot, split, chain, etc. best, but I really like many other types of needlework, too, including crewel,blackwork, pulled thread, cross stitch, and Hardanger. I enjoy general embroidery and crewel the most, although I’m always up for new projects and challenges ! I adore your site and look forward to receiving updates daily ! I like general surface embroidery. Not much of an answer, but true nonetheless. I enjoy pieces with a wide variety of stitches and colors. I don’t really like anything with counting (ironic, since I am an accountant by trade), but most anything else I enjoy. I am still trying to figure out what kind of embroidery I like best. i’m currently learning bead embroidery, and I guess surface embroidery is what I seem drawn to. The only think I have much experience with is cross stitch, which I enjoy, but I’m really wanting to branch out from that. Crewel work sounds appealing because I like the idea of using wool. Favorite form of embroidery is three dimensional – be it Brazilian, Silk Ribbon or Stumpwork. Love the appearance of items coming off the background. Enjoy all types! I enjoy crewel work because it gives me a sense of being tied to history and the many generations of women who have worked with wool embroidery through generations. Thank you for making these kits available. Love crewel work! Pretty kit! I’ve only done general surface embroidery and cross stitch, which I enjoy. But I would love to try both white and goldwork, I think they are so pretty! My long term favorite style of stitching is absolutely crewel! it is what I first started with when I was a child and I find it soothing and relaxing to do. I really love how many colors of fiber you find in crewel work, and it all seems to go so well together! I love crewel work. Who couldn’t like wool and linen. I also love the look of gold work but I amstill a beginner at it so my doesn’t look as good as it should. I like counted cross stitch because I can do it and it always comes out looking good. My needlepoint is ok but my stitch selection is usually bland. Pulled work is nice too. But I have to be relaxed when I’m doing it or I pull too hard and everything looks pinched. Basically I like embroidery work that takes a need and some thread, wool, silk, gold. Love these new crewel designs. My current talents include cross stitch and embroidery, with some beginner crewel kits years ago, I guess technically these are my favorites. I would love to try something like this since it a beginner project for someone not brand new!! I’m ready to expand. My first love would be Crewel work using bright, vibrant colors and my close second choice woukd be counted cross stitch and that in lighter and more pastel colors. A vision of loveliness with so many awesome techniques to use! I love it! Gloria N.
Hi Mary, I most enjoy surface embroidery, done as embellishment on everything from cottons to wool appliqué, to crazy quilting and on clothing. Crewel embroidery is high on my list of next things to delve into. Thanks for a cool giveaway! I love all types of embroidery, with perhaps the exception that I have never liked Brazillian embroidery. Whitework is currently at the top of my “like” list; I am currently working on a thread painting and a cross stitch projects, and just completed two crewel pillows. Oh and just finished two cross stitch baby bibs, and an heirloom baptismal gown. I like surface embroidery the best because I like to embroider daily use items the most. A reusable bag with some carrots or a hand towel with an embroidered edge makes me smile whenever I set it out or use it. I love Ribbon Embroidery. I have done a lot of Di Van Neirk beautiful panels. I would love to try Crewel Embroidery. The colors are just wonderful. My favorite technique is crewel because I love working with wool – the depth of color, the feel, the look…..
After many years, I have recently taken up embroidery again. I just love trying all the different kinds of embroidery and have joined the local Embriderers Guild for further inspiration. I think surface embroidery is my favourite, but I have yet to try crewel work. Perhaps the opportunity may arise soon! Currently I am in love with crewel work having just been on a really good course in this type of needlework, so much opportunity to use different stitches and produce surface texture. In fact I am becoming to realise that it is texture in embroidery that particularly attracts me as I do enjoy stump work too. I really love all kinds of handwork, including hand quilting, appliqué, needlepoint, cross-stitch, crewel and red work. The intricacies of these patterns and the thread are amazing. Right now, I’m hand quilting pillows I made for Christmas presents, so that would have to be my favorite right now. I guess general surface embroidery. I’ve been wanting to try crewel and gold work, but my favorites are the braids. I enjoy thread painting embroidery especially of flowers. I like to then put these into crazy quilts. I love to do general surface embroidery. I do lots of redwork that I incorporate in quilts that I make. I love to do different stitches so I do get bored by the redwork sometimes since it is generally mostly outline stitch. I also do some embroidery for church linens, so I do white on white with lots of different stitches. I love Needle ‘n Thread and reading all about embroidery. Thanks for your hard work on the website and blog entries. I enjoy many types of embroidery, but surface embroidery has a special place in my heart because this was the first type of embroidery I learned and it was my grandma who taught me. From her teaching me surface embroidery, I continued to learn other forms on my own. But the time spent with my grandma is a treasure. I enjoy just about all forms, though I’m pretty much over cross stitch after doing it almost exclusively for many years. If I had to narrow it down to one though it would be crewel. I love the variety of stitching possibilities it offers. I’ve only ever done cross stitch but admire and aspire to so many more types of embroidery. What a great design! Traditional motifs and modern style. My current favourite is surface embroidery, because it’s both liberating and challenging after a period of single colour, counted thread blackwork. I have not done any crewel despite wanting to, buying an excellent book and inheriting my aunt’s stash of appleton wools. This sounds like a great way to get started. If I am just doing embroidery, I like cross stitch best. But my passion is crazy quilting in which I use a wide variety of hand embroidery, ribbon embroidery, even some cross stitch! I love the freedom of crazy quilting. So far, i’ve only done general surface embroidery and cross stirch, but next I want to try reversible (!) blackwork. Not necessarily in black, though. I love cross stitch but have been learning new stitches to embroider. I would love to learn to do a crewel piece. My friend does exquisite crewel work and has inspired me to try it. It’s time for me to get back to crewel! This kit would be the key to this pleasure. Ooh, I swoon for that kit! The only kind of embroidery I’ve done (so far) is surface embroidery with DMC cotton (and gold sewing thread). I’m champing at the bit to try wool. My favourite kind of embroidery to admire is goldwork and silk, though it’s out of my price range to try for a while. I love crewel work as it is such a traditional expression of art, which can be presented, as this piece is, in a refreshingly modern approach. This stunning will appeal to all ages and fit into any decor. I have some techniques which I have tried and would not care to try again! I do not have a favorite as I like to try different types of embroidery. My last projects were a white work and a black work pieces. It’s time to try a different technique with different threads. My favorite form of embroidery is Hardanger embroidery. I have experience doing many types of embroidery, but Hardanger is my favorite because of the intricacies of the different designs and the multiple ways it can be displayed and even worn. Crewel work is my new favourite kind of embroidery. I don’t know how I didn’t discover it sooner. I love it because it is so versatile. I pretty much do redwork but in colors other than red. Then I make them into wall hangings or quilts. I have done other types of hand needlework over the years. It is very calming for me. Love your tutorials. I usually do general surface embroidery but am also interested in learning stump embroidery. I am just beginning to experiment with incorporating embroidery into my book binding, both on the paper and on the book cloth. I need to learn more!!! I really enjoy surface embroidery but these crewel projects I keep seeing are very intriguing and tempting. I am never sure what information is needed in the “website” space but that’s for another time. I have picked up embroidering again after a many year hiatus while recuperating from a bad fall. I love surface embroidery and have been embroidering any and all flowers I can get my hands on. I have been thinking of doing some crewel work and this would be the perfect pattern to work on. I’m pretty much a beginner but I’m hooked! Right now I’m doing surface embroidery but crewel has me so intrigued! Hello! My favorite type of embroidery is general decorative stitching. I bought your lovely floral alphabet book, and made monogram Christmas ornaments for all of my sons’ teachers! I love all different kinds of embroidery, except counted work. I always seem to come back to general surface embroidery. You can just do so much. General surface embroidery for the richness of color and variety of stitches (Wagner). Blackwork for the meditative feel and repetitive balance (Yanni and David Arkenstone). Crewel for color and variety within a balanced framework and a traditional mindset (Bach). Beadwork for the sparkle (Strauss waltzes). Um . . . am I a little scattered? I love goldwork the best, even following courses here in The Netherlands! Also, I love whitework, especially Hardanger and pulled thread. This crewel kit would be the best way to get to know this intriguing technique. Many thanks for the offering and all your blogs and detailed descriptions. I learn al lot from you! I’m trying to settle on a type of embroidery that I like the best, but it is very difficult. I like it all. However, arthritis in my thumbs is telling me that the larger the work the better off I will be. It’s looking like crewel will be best for me! I like whitework and silk shading the best. I’ve done a tiny bit of crewel work, but still have the Royal Persian Blossom to do. So don’t enter me into the contest, I have too many kits to work already. I mostly like surface embroidery because that is what I know how to do. I’ve always wanted to do crewel. I love the vibrant colors and it is a little easier to do with my limited vision. Hi Mary, what a beautiful pattern and the colors are lively. I am currently needlepointing up a large rug using a William Morris pattern and Appleton wool. I want to lay it on the floor in my familyroom, however, LOL, my husband said he would never walk on it! Soooo, it will have to be a wall hanging in the family room instead. I love working in wools but am very diverse with my stitching. I also have an oriental piece I am cross stitching using DMC. I needlepoint with a variety of fibers depending on the hand painted canvas’ design. I would love to try my hand at this giveaway!! I like crewel embroidery best. It is easiest for me to do since my hands and fingers are somewhat numb (MS), and I can drop smaller needles and not even notice until I try to take the next stitch! There used to be a lot more crewel kits available than what I can find anymore. I love surface embroidery & reticella lace, but want to try crewel work too!!! Pulled Thread on linen has always been one of my favorite stitching techniques. Facing the challenge of a square grid and watch it transform into rows of scallops and curves and windows by using intentionally directed stitches is amazing. Mix in a bit of rigid Hardanger and some surface embroidery and my day is made. The best stress reliever ever. Pulled thread on linen has always been one of my favorite stitching techniques. Facing the challenge of a square grid and watching it transform into rows of scallops and curves and windows by using intentionally directed stitches is amazing. Mix in a bit of rigid hardanger and some surface embroidery and my day is made. The best stress reliever ever. It depends on my mood, mostly hardanger, surface embroidery and needlepoint. I haven’t actually tried crewel since a very poorly stitched piece when I was pretty young. I’d love to try it again now that I know much more about stitching! I have done crewel embroidery, cross stitch and general surface embroidery over the years. Right now I am mostly doing surface embroidery but I am still very interested in crewel especially when I see beautiful kits such as this one that is being offered. I can’t honestly say that I prefer a specific style of embroidery as I love all things embroidered. I just love all the kits that you feature in your column and I read every single one and visit all the sites that you highlight. Thank you so very much for the work that you put in to your e-mails and I hope that you keep doing this for many years to come! I also would like to Thank You! For the opportunity of winning such a beautiful kit! WOW! INCREDIBLE! I love the new kit. I have done a couple different types of embroidery, prefering all over cross stitch. I have not done crewel in years. I’m giddy. Love the pattern and the colors are scrumptious. This is the perfect project to keepme challenged. Hello just love your news letters that I receive and would love to win a pack of this beautiful crewel work. I am very new to embroidery and I’m totally hooked. I’ve done just basic stitches, chain stitch, lazy daisys , French knots etc. I’ve been watching the video tutorials to learn more. I like red work, and surface embroidery best, but have started trying some new stitching. I am doing lots of counted canvas work lately, but also other counted worked on linen especially if there are lots of interesting stitches. I love the appearance of crewel work and would love to do some. Thanks for the giveaway. I enjoy most types of embroidery. Thank you for offering a lovely giveaway. I love crewelwork and would love to win so I may be able create a beautiful picture for my dining room. Oh I like it all! I do a project in one technique and when finished another project in a different technique. I love the different feel each technique gives and wonder at all one can do with a needle, some thread and a piece of fabric. It’s never ending! Thank you Mary for another give away. My favorite has always been crewel embroidery. I guess I like the wool aspect of it. I’m happy to see it making a comeback. I love all embroidery. I would dearly love to win a crewel kit as I want to expand my skill base which currently lacks crewel work. I pray that being on the other side of the world is not a problem. I love any surface embroidery including crewel. I also like to add some stump work techniques to put a 3D accent on my work. I used to do a lot of cross stitch but I find that too limiting now with each stitch having its own set place in the overall scheme of things. Hi Mary my favourite type of embroidery would be surface. I actually like all types of embroidery. My first finished peice was crewel embroidery. Irises in a coffee tin. I love almost all types of hand embroidery (not a fan of machine!) – the relaxation, enjoyment, challenges, etc. are all great, and the camaraderie of connecting with other like-minded souls is wonderful. Crewel is next on my must-try list. This piece of crewel is awesome. These are my colours. I love to work in bright colours and often variegated threads. I love all types of embroidery but having come back to it later in life I have decided that there is only so much I can do and afford. I enjoy canvas, surface, black/red work, jacobean and 1960’s styles. Right now my favorite is counted canvas work – the rhythm and predictability is welcome given work, family, etc. which is full of variety! My favorite embroidery is free style. I guess the biggest reason is because it’s what I learned to do. I’m just now learning counted cross stitch. Brazilian embroidery fascinates me. I’ve been studying the bouloulion stitch by reading needle and threads helps. Also watching YouTube on embroidery technics. I have been trying different types of needlework. I just took a class and did Ukranian Whitework. I could never in my lifetime try them all but it’s fun to try. I started with Crewel and I still love it many, many years later. I enjoy surface embroidery, but my favourite is Jacobean Crewel. I like the variety of stitches one can use when stitching such a project. I would love to be able to stitch this kit. Thank you for offering it as a giveaway. I have stitched hand embroidery most of my life, starting with 4-H clubs as a young person. I enjoy beauty of the finished piece, and the satisfaction I was able to create. I have not used wool thread before, and if I am lucky to win I will start in a wonderful way. I’ve just picked up embroidery lately and am trying out surface embroidery, and funny that this post came along, but I just ordered a crewel kit that I’m getting ready to start on, so I’m not sure which type I like best yet! 🙂 I’ve done cross-stitch quite a bit in the past, but my interest in that has waned and I’m off to explore the previously mentioned types now. I’m having fun!! I guess my favorite is general surface embroidery, however I want to learn more. I just love crewel work. I love working with wool because it is very quick and forgiving for a beginner embroiderer. I love to do a variety of embroidery. I love your newsletter. You have taught me much. I enjoy and appreciate all types of embroidery, and did some crewel work years ago. This design is really beautiful, and a good size to try all the different stitches and colours. It is always exciting to see the picture develop as you work it. At the moment I am working on creative canvas work, as I love the dimensional quality of the different stitches and textures. Also a bit of cross stitch and some surface embroidery. I enjoy doing cross stitch, surface embroidery and have just started doing some basic stumpwork. In the past I have done some basic crewel work, but nothing as complicated as the patterns that you have shown on your website. Lately my stitching has included temari (Japanese embroidered thread balls) and pojagi (Korean wrapping cloths and other items). I love that we all throughout the world are connected, including through our various needle crafts. I have had my eye on these kits for years. I think I’ll go take a look at Wooly Thread’s website. My favorite needlwork is Japanese Temari, but I’ve had a needle in my hand since I was 6. Much as I love Temari, it’s wonderful to take a little break and return to the techniques I was taught as a child and honed throughout my life. This is a beautiful kit, the colors are fantastic. I’d love to work some crewel again. Thank you for this opportunity, and sharing your expertise. I’m hoping that things are going well for you. the mail carrier that little package of patterns. Grandma and an aunt lived just up the road from us. I enjoy reguler surface embroidery but I did complete one crewel embroidery kit years ago and would like to try it again. Mary, I love your daily notes and inspiration. For me, my favorite is probably plain old regular embroidery on cotton or linen with cotton threads. I have enjoyed crewel very much in the past and this kit and desire have inspired me again!! I pray that God will heal and restore you to good health!! I really can’t answer which type I like best. I am a total newbie and am enjoying experimenting with different types of embroidery. So a chance to try one of these crewel kits would be a blast! I particularly love wool embroidery, probably as it’s more forgiving than some other forms of embroidery but I continually challenge myself by participating in classes, learning and trying new forms and new designs. I belong to a well established embroidery group where I am able to access classes easily and at an affordable cost. Embroidery is my relaxation. Wow, this is very pretty. I love service embroidery. I have been learning this beautiful needlework for the last year. I have wanted to try working with wool but did nt know where to start. This kit looks like it would be a wonderful extension to use the stitches I have been working on. This is so exciting! My favorite stitch is the Satin Stitch. My favorite is surface embroidery. I like to pick the pattern and then use my own colors. I’ve not tried crewel embroidery but would like to. I love all forms of embroidery but I adore Crewel Work. The concentration required for those first few stitches then the rhythm and flow, filling the beautiful design spaces with texture and colour. Thank you for the opportunity to win this beautiful kit. My favorite type of embroidery is general surface embroidery. I love the variety of stitches and the results. It feeds my mind and my soul. I would love to try crewel. Stitching is my happy place. Thank you for helping me learn so much. My favorite type of embroidery is whatever I have in my hand. If I’m forced to choose just one, it would probably be surface embroidery because I love the variety of threads and stitches. This Talliaferro kit, though, would be just the inspiration I need to have a crewel project in hand. Beautiful design and colors. Thanks for the chance to win. My favorite type of needlework is cross stitch – it is what my great grandmother taught me when I was little. I’ve been learning other types of needlework, but so far I do not consider myself more than just practicing at them. I am a cross stitcher. Thanks for the chance to win…theknittedlamb. I love all kinds of embroidery, but if I have to choose just one, perhaps it would be white work! Thank you for the chance to win this beautiful kit! Someone is going to be very happy on September 5th! I really love gold work and stump work, but what I do mostly is embellishing crazy quilts and I have done some sue spargo type work. I think I would like to do one of your kaleidoscope embroideries, as I have been crocheting them. I prefer counted thread embroidery, mainly draw thread, pulled thread, reticello. etc. I never really try surface embroidery but I would like very much to try crewel embroidery. Wow a wonderful crewel project and suitable for beginners to the discipline. I have admired crewel work for years and have set myself a target to learn this year. I am currently reading a book by Hazel Blomkamp to get me started. I have also read your online tips and tutorials. My favourite embroidery discipline is cross stitch followed very closely by white work. Thank you for all you do for us embroiderers Mary. My favourite stitch would have to be the classic cross stitch. This is my favourite stitch because it was the first stitch I learned, and then that started a passion that lead me to learning so much more. I learned how to cross stitch at a summer job at Lang Pioneer Village. It was the first time I was paid to do something I loved, and it is here I cross stitched my heart out for a summer. As my confidence grew, I started to learn more stitches. I am still mastering surface embroidery. I think cross stitch is a lot of people’s first stitch, and has opened many up to this hobby/world. It is simple enough that anyone can do it, and that motivates you to tackle the next stitch. and the one after that. The trusty cross stitch, the gateway stitch. Started general surface embroidery as a kid. Love embroidery on felt I make. I love doing counted cross stitch, sometimes with silk thread. I do a lot of reproduction 18th century American samplers. Many very challenging. I love surface work, crewel,cross stitch and a chance to win this kit. Crewel! I love crewel! And my most favorite crewel is anything that Anna designs. I love her color choices and her exquisite designs. (I actually love her color choices so much, that I’m using them for another crewel project! I love crewel because I love wool thread (I actually hate cotton embroidery thread). Once I discovered wool thread, there was no turning back. Lattice is lovely! And who doesn’t love Jacobean? I can’t wait for Talliaferro’s Oaks of Woodlawn project to be done. My favorite is Crewel work, but I’m also partial to White work, but Crewel is my favorite. I love to do cross stitch, crewel and surface embroidery. I love all embroidery , particularly stump work and crewel . The colours in this particular kit are my favourite ! I’m mostly a cross stitcher, even if I try to be other things. It’s meditative to me, the rhythm of making x’s. Not so meditative is when I miscount! and of course cross stitch can be fairly complicated at times. But mostly I find it relaxing. I’m always challenging myself to branch out, however, and I think this crewel kit looks very fun! Thanks, Mary! It really depends on my mood and what I want to use the finished item for. There are so many beautiful ways ti use thread that sometimes it is hard to choose. I have done every type of embroidery except gold work, but someday I must attempt to do try goldwork. I just purchased some Strathaven linen for a new project. The La Serenissima is lovely. I love trying something different. I have the most experience with cross stitch but I’d put general surface embroidery at the top of my list at this time. I’ve never tried crewel but would like to. I’ve worked with wool in other fiber adventures and love it’s rich feel and warmth. Thanks for this opportunity to dream about winning. I love hardanger, cross stitch and pulled thread embroidery… And all the counted thread embroidery because… they rule the world! It is almost impossible for me to say which type of embroidery I like the most – I love all of them. But crewel would have to be one of the top ones although I prefer to use silk or cotton threads for their vibrant colours. That is probably bordering on heresy, but I figure it is a free world . I have had a long-standing hankering to do one of these designs so hopefully it will be my turn to be lucky. I love white work and gold work but have always wanted to try crewel work. I enjoy many types of embroidery, but when I just want to relax and let my mind rest, I always turn to needlepoint. The strong structure of the canvas lets me go into an almost meditation mindset that I find totally refreshing. If relaxing isn’t my goal, then there are a myriad of techniques to try! Of course I have enough projects in my “stash” to keep me going for at least 50 years! I like to embellish my quilts with embroidery stitches that add texture and interest!! I add all kinds of stitches to various areas….depending on the design. I love the crewel embroidery design. I am in love with cross stitch because it was used as therapy for my lazy eye when I was 5. I have beautiful eyes now and am very good at this art. I am as equally in love with blackwork combined with goldwork because it is fabric version of zentangle art that I also love. In fact, I am hopelessly in love with all embroidery and sewing, and I don’t need to know why. I love all kinds of embroidery…….To look at!! But I’m a beginner so regular surface embroidery is what I do now. I used to do beaded embroidered jewelry, but very little now. The holes on the bead got so small I was having trouble seeing them! 🙂 I would love to work up to the level I saw in the gallery for the crewel work, but I don’t think I have enough years left to get that good. They were so beautiful! I love all types of embroidery…not that I have mastered them, and I enjoy learning all of the tricks a needle and thread can possibly make. I love Crewel embroidery for its imaginative designs and glorious colours! Mastering the stitches that I haven’t used before and the more I do, the more I realize that I’m a very happy beginner! Although I have done cross stitch, silk ribbon embroidery, crazy quilting, and needlepoint, I prefer general surface embroidery. I have books on crewel but as yet haven’t got the courage up to try it. We just moved to a new house and someone made me two fine white cotton doilies that I plan to appliqué on a blue background to make decorative pillows for my bedroom. This crewel design in the kit would work up nicely into an accent pillow to go with the doily pillows, as well as teaching me the basics of crewel. Another fabulous give-a-way, who wouldn’t want a fantastic Talliaferro Classic Kit to win. I have never done Crewel work, but I have wanted to do for a long time now. Every time I try to get organised to do something, I can not decide what design and kit I should choose. Also some of my other WIP’s call out, ‘you haven’t finished me yet. But if I was lucky enough to win this terrific prize, I am sure that they would understand that I would love to get into a new medium and style, as I love variety in my life. Thank you again for the opportunity. Best wishes, Julie. I have done a lot of counted cross stitch, and I love it, but I am looking to expand my skills. I like counted thread embroidery the best. It’s like cross stitch, but used more stitches than just the simple cross. I used to do crewel embroidery and would love to get back to it. I am reasonable new to embroidery and have recently learnt portuguese whitework and have really enjoyed it. I have been looking at Crewel work for a while and I think it will be my next project. I have been embroidering since last September. My favorite stitches are the long/short stitch and the satin stitch! Thank you for your hard work on this site! Where do I start? I’m generally drawn to the delicacy and technicalities of white work, then find myself seduced by the colours in needle painting! And then there’s my current crewel project which I love (also Talliaferro) – again for its gorgeous colours, the multitude of stitches, and historical influence. Thanks again Mary for the opportunity to win this (my fingers are crossed)! I am new to embroidery and so just trying to try as many different types as I can. I haven’t found a favourite yet. I just love them all. I haven’t tried Crewel yet so this kit would just be perfect. I love all embroidery but I tend to gravitate towards traditional work especially Stumpwork, Whitework and anything that can be stitched on silk gauze. I have always loved the look of Crewel but have never attempted this technique. Maybe now will be the time! These look like magical flowers! I love surface embroidery, cross stitch and needlepoint. I love learning new stitches and working with different types of threads! I have to admit that I love a needle with thread in it. Even sewing a hem gives me pleasure. My favorite embroidery is free hand. I like to see the artistry of it. Nothing is off limits. I have recently been researching Stumpwork. I will try my hand at that next. I love stumpwork, crewel and general surface embroidery as I love lots of colour. If I was forced to pick one it would be general surface embroidery for the variety. My current favorite is surface embroidery, as that is what I’m currently doing. I have been wanting to try crewel for some time now, as I keep seeing such beautiful work. I love chicken scratch embroidery and would love to try crewel work! I have done Surface Work as well as Crewel & Thread Painting. Two weeks ago I became grandmother to a baby girl so I have ordered some silk floss to start a few Heirloom pieces for her. I am also becoming interested in Stump-work after I saw the wonderful violets in Inspirations. I would love to win this Crewel Kit. Thank you for that opportunity. My favourite type of embroidery depends on what I’m doing at the time! It could be goldwork, which stretches my skill level; it could be thread painting which I find very relaxing; it could be stumpwork which allows me to be very creative and lately I have started doing some canvas work which Sure allows one to play with thread colour combinations; and ribbon work is to die for! However, what ever I am working on is my favourite at that moment as I would be bereft if I couldn’t stitch ! AND how could I forget Jacobean work, apologies to Hazel Blomkamp!!!! My favorite is whichever I am doing at the time since I often have several going at once! I am working on a surface embroidery project right now. Counted Cross stitch, as it is the one that I have the most experience with. I have also dabbled with Crewel, embroidery, and bead embroidery. I’m mostly doing hand embroidered appliqué currently but keen to branch out. I like a lot of different kinds of stitching, but my absolute favourite has to be blackwork. I love the clean lines and geometric filler stitches. I like surface embroidery using lots of different stitches best, but crewel work is a close second! Hope you’re keeping well, Mary. I love all surface embroidery. At this moment in time I am doing a large amount of crewel work. I especially adore using everytype of thread medium to achieve the results I like to see. Thankyou for the chance to win a gift. I love everything with satin stitch included. It looks so smooth and noble. But I am also fascinated by every other type of embroidery. Love the colors, they are so vibrant. Thank you. Having just returned to embroidery after 40 years I am in a quandary as to my favorite. I feel like a kid in a candy store. I love it all! And there are things out there I never dreamed of. So many choices and so little time. I have loved cross stitch and tapestry. At the moment I am finding embroidery so rewarding. It is the way a blank canvas becomes a textural picture that amazes me each time I work a piece. I love all your Needle ‘n Thread articles, but I am particularly happy to have you feature Wooly Thread. I have long wanted to do crewel embroidery and your give-away kit looks delightful. I joined the Wooly Thread Appleton Wool Club and have thereby acquired all their Appleton wool colors. It’s time I get started with crewel embroidery. I enjoy cross stitch the most but almost any kind of stitching with a needle pulling fiber is my favorite! My favorite style of stitching is cross stitch. However, I love to try all types! I really love blackwork but also crewel! thank you! I love all forms of embroidery. I used to do cross stitch exclusively, but I’ve been branching out and trying other things. I love general surface hand embroidery the best as the learning is limitless. But I am anxious to try crewel because I love the innate texture it has. I love simple hand embroidery. I’ve never tried crewel but would love to start. I have to say I like cross stitch the best but only because I’ve not done much else! Would love to try crewel work, and it seems a lot like this would be a perfect introduction! I love your blog for the variety of embroidery that it shares. While I do not embroider as frequently as I’d like, I enjoy all things stitchy. I’m not sure what type of embroidery is my favorite since I seem to have multiple types of projects going at once. Currently, I am working on three projects: a surface embroidery sampler, a cross stitch piece, and a Laura J. Perin needlework piece. I would love a chance to work with wool and take my first shot at crewel work embroidery! Traditional embroidery is so beautiful, but I am amazed at the creativity expressed in the modern embroidery. They are so fun and beyond the stamped projects most of us grew up working. I always catch myself thinking, I didn’t know you could do *that*! What a beautiful design!! I’ve done a little silk ribbon embroidery, some crewel, but mostly surface embroidery is what I enjoy the most. Thank you Mary for another great opportunity. And I hope you are doing well. I love generall surface embroidery as one can incorporate techniques from all types of embroidery. It is versatile for decorating and creating. Loved doing Crewel as a young mother. Now retired I do any types I can get ahold of. Never to old to learn. Haven’t done gold/white work but want to try it. I try to incorporate embroidery in my quilting projects. Gives them a different perspective. When I saw the beautiful Crewel give-away it brought back memories and I thought I really would like to do it again. Presently I do straight stitch embroidery. I love to do counted-cross-stitch in front of the TV at night. It keeps my hands busy, engages my brain and I end up with a lovely creation of something that I can (usually) give as a gift. And I prefer the challenge of counted x-stitch vs stamped x-stitch — going from a completely blank piece of fabric to a completed project gives me a profound feeling of satisfaction. I learned crewel back in the 1960s when I was in my teens. It was the grand days of Elsa Williams and Erica Wilson. It was also the grand days of easily available wool threads. Knitting, crocheting and embroidery were all done with wool. Even dime stores sold wool yarns. I gave up crewel when cross stitch popularized and with three young children I had less time and money. I am currently on a hardanger kick, but it would be great to revisit crewel embroidery. I love the colors on this kit and the smaller size (more chance to finish and less money to frame). Here’s hoping that I win. and thought I really would like to learn Crewel work. This design is such a pretty one and its small that it would be a great beginner starter for crewel. it reacts to different stitches. Love crewel! Maybe because it allows me to experiment with so many stitches and designs. Thank you, Mary! I love to embroider! I don’t think I have a style that I prefer most..I just like the feel of thread and fabric and love that I can create pieces that I love. I have done surface, crewel, thread painting…love them all! I have to confess though, that I do not like cross stitch…too boring for me, doesn’t afford me enough creativity. This kit is gorgeous and I would love the chance to stitch it up! I’ve been doing a lot of counted canvas work, but have been feeling a real need to get back to my first and foremost love: Surface work (crewel included). This is beautiful and I would love to win to stretch my boundaries. I started out in cross stitch, then going to needlepoint and all its variations. Theses days I am working to learn stump work and crewel . I’ve always been intimidated by the long and short stitch so beautiful in crewel, but am learning the technique. I really like the crewel stitches and have gotten hooked on them. Beautiful! Would love to win it! I love crewel! I Love surface embroidery as it is so versatile for needle drawing and painting. I especially enjoy mixing it up with different kinds of threads, creating various textures. Thanks for the great website, I’ve learned so much from all your postings! I love embroidery of all kinds. I haven’t done any crewel work since the 1970’s! Yikes! I do love general surface embroidery because it gives such great scope for the imagination – from serious and formal to loopy and whimsical. I love embroidery with texture and using different types of stitches, so crewel fits right in. Actually most embroidery styles fir within this definition, I am not a specialist in any style. I abolutely LOVE that Kashan crewel kit! It matches an abstract pink and green picture I have hanging over my bed!! I have done mostly cross stitching but love projects with pictures created by various stitches. I am so inspired by this website! The wonderful things you post are interesting and informative. Your passion for stitchery-craft shines!! Thank you for sharing yourself!! my problems disappear and life is good! I make quilts and some I applique which I embellish them with decorative stitches. I really love the look of the Kashan Crewel Kit and would like to make something beautiful like that. Thank you for a great give-away!. It’s beautiful. I prefer crewel work for the texture and color. Persian always seemed prissy to me, though I still do use embroidery thread. But I guess I am still a hippie at heart, because crewel reminds me of the great designs during the sixties and early seventies. And yet, traditional patterns are classic and still beautiful, like Jacobean work. The most relaxing for me is counted cross stitch. But I love to try new things. For example, I recently got a book (in French) on the stitching typical to the French community of Cilaos. So I’ll learn a gorgeous new to me technique and practice my French! The crewel work you showed today (and many times before) is gorgeous. Maybe it’s time to jump in the deep end and try a style my sister swears by! My Mom forced me to learn cross stitch at 8 years old because she did not want me to grow to be a “Tomboy”. What can I say, I loved following my Dad around and if he had a hammer, I wanted a hammer? So grateful she made me learn, because from there I loved making pillows with general surface stitches, then morphed into the Crewel pillows, then pictures and then came the 14,22,32 count stitch work! Made so many beautiful pieces as wedding, birth and friend gifts until my eyesight just couldn’t take it. I still do lots of embroidery for quilting, clothing and sometimes kitchen cloths. So relaxing and may never give it up. Love Mary’s website, so glad I found it cause when I would embroider or crochet, in an airport folks would say, “I haven’t seen anyone do that since my Grandmother”…..My granddaughters know how to embroider and some crochet! My favorite type of hand work is cross stitch, but I also do ribbon embroidery and freehand embroidery and some lace work. I have never done crewl emboidery but it looks interesting. I also crochet and quilt and do sewing projects! Thanks for the chance to win! I’m a fan of many types of embroidery. I stated with crewel when I was very young and haven’t looked back sense. Using different threads, playing with texture and color make embroidery a very dear pleasure. All the best to you and thank you for your daily inspiration! I don’t have a favorite. I just love working with a needle and thread and beautifully colored threads or on whitework. It is so much fun to try different kinds of embroidery. Learning about the history and traditions of all the different countries. To understand about color, fibers, dyes. It is all wonderful. I like to do Samplers. The different stitches, designs and threads make them great fun. I especially love those old row samplers from the 80’s. They are so charming. I too enjoy different types of stitching at different times. My absolute love is Hardanger. Whilst doing these long projects, I often want the colour and fun of crewel work and beading. So I’m never working on one project at a time and switch between as I feel like it. I like surface embroidery and crewel, cross stitch is really boring to me. Counted cross stitch is insanity producing and as a result I tried it once and won’t work it every again. Simply admire those folks who can do it. I’ve never done crewel but I enjoy learning different techniques I love different stitches in patterns. My very favorite embroidery is surface embroidery. With today’s choice of thread and the colors, and the different types of stitches, my finished piece is always a surprise. Then there is the nostalgic side of embroidery. At the ripe age of 9, my mother taught me. Then I spent quite a bit of time embroidering on my doll close. I liked adding lots of flowers. I just recently found your website. And I would like to thank-you for your website, and all the work that you put into it. I have made it a daily ritual to check your site out. You have inspired me to do my best with my embroidery. Right now I am working on a project that I plan on framing. I took the redwork concept, but with the shades of a mauve and blue. It’s stitched with a stem stitch (which is my favorite stitch), and then I am adding a few other types of stitched to add texture and interest. The project is an emperor and his empress. But I was so impressed with your void A project that I’m going to embroider a butterfly the same way to go with my emperor and empress. Thanks again for your grand website, and happy embroidering. I think in my former life, I must have been a lady-in-waiting doing crewel Jacobean embroidery, in the castle. I have just started using wool thread after several years of surface embroidery. This kit is lovely and really speaks to me. Of course crewel work, because of the beauty matching colors and design that’s belong to them together. And olso General surface embroidery, because of the freedom of stitches you can work , variety of stitches and beautiful colors combination. I love surface embroidery – I love the freestyle feel of making my own designs and trying out new stitches with easily available floss. But I love the look of crewel and agree that it seems to be a cooler weather activity 🙂 Will have to check out all the other kits you’ve reviewed too, as this one looks very appealing. I love to do shadow embroidery,and have always wanted to try Crewel. I’ve done some cross-stitch too. What ever I try seems to be my favorite at the time Stump-work is also fascinating to me . It’s hard to say which type of stitching is my favorite. Jacobean crewel work is certainly at the top the list. I like the variety of stitches and the history of it. That said, I love needlepoint too — creating texture on a structured ground. I love all forms of needlework but my most favorite is Whitework. I find that I enjoy learning new forms. I’ve never done gold work and have done very little crewel work. You asked why I liked whitework best, because it looks soooo difficult but is fairly easy and lacy. Do I have to choose just one? I love needlepoint the best because of all the fun threads and stitches I have learned to do on canvas. That and I love geometric canvas pieces…. I prefer cross stitch at this time because I’m fairly new to stitching and I find the instructions to be pretty straight forward. It relaxes me. Hi Mary, what a lovely project and generous give-away! I’ve always done cross stitch, since I was a child, and have taken on some pretty serious projects – large full coverage designs. I just love the methodiacal, geometric nature of it. But lately I’ve been trying my hand at more surface embroidery, stumpwork, and I’ve just ordered my first kit from Hazel Blomkamp. I can’t wait! This would be my first attempt at ‘proper’ crewel with wool thread though, I love how there’s always something new to try. I’ve been doing a lot of cross stitch lately, but I’ve been admiring some instructional books for stump work and crewel work, and I deeply deeply love how blackwork looks, and, and, and, etc.! So it’s a really hard choice to make. Well, at any rate, I have a special fondness in my heart for surface embroidery, because my dad did some when I was younger and it just seemed so magical! He would take a shirt and then a beautiful, tactile, image would appear over the next couple of weeks. Looking forward to stitching with wool on cool fall evenings. I like pulled thread, i’m always amazed by the patterns that are created just by pulling, it’s magic! I really love surface embroidery, I first started at 5 with simple stitches so it will always be special. I love learning new techniques and different needlework from around the world. I enjoy all forms of embroidery. At the moment I am embroidering a vase of poppies that I painted onto fabric during a workshop weekend. I found it very relaxing. I have never done crewel work before, but the colors and design intrigue me, and being small would be a good one to start, particularly if the instructions are easy to follow. I am good at embroidery, which is why I like doing it, but I love to be creative and will often use stitches that are not very well known. I don’t really have a favorite, I tend to transition from one style to another. 🙂 I’m almost done my current stumpwork project tho, and its been awhile since I’ve done crewel work! I enjoy needlepoint and samplers – they both allow me to do a variety of samplers. Crewel can fit into both of these, since the stitches are used in both. I’m in a bit of an exploration phase with embroidery right now, trying everything out. I can’t say at this point what I like best … but am enjoying the whole process of coming back to embroidery. Another lovely giveaway! I enjoy many forms of embroidery, but I am currently working mainly on crewelwork. I love the feel of wool and linen, also modern interpretations using other fibres. I prefer general surface embroidery because it allows for a lot of creativity and flexibility! I enjoy dabbing in white work also, especially when I want to gift someone a special monogram. I just don’t have the focus and patience for counted work! Recently I’ve picked up glazig embroidery (a “folk” style of embroidery from Brittany, in western France). I can’t say it’s my favourite yet because I’m a beginner at it, but I’m enjoying learning it greatly! I love general surface embroidery and counted cross stitch. I love every kind of needlework from knitting to embroidery, crewel to crossstitch. Silver needles or bamboo ones they all bring joy in the creation the colors and the satisfaction. Over the years I have gifted so many projects that now I am creatingfor my home. This project would be perfect! At the moment I’m really enjoying some traditional needlepoint add I find it very relaxing. When I’m feeling adventurous I like some surface embroidery but I only ever embroider flowers…. Nothing else…. In whichever technique it just has to be floral! I love all needlecrafts, but my favourite is Goldwork, which I learnt recently, it is a truely absorbing art and the end result can be stunning. A lot of Crewel patterns lend themselves to goldwork so it would be brilliant to try to encompass both crafts in a pattern that has been won. I couldn’t possibly choose one style or even two. I am always looking at different styles and trying to fit new stitches into the project of the moment. I always come back to crewel. It’s like painting for me. I’ve always loved crewel embroidery. As a child I was always mesmerized watching grandma Rose work on hers and fascinated how all those little stitches could combine to create such great art work. Counted cross stitch is my favorite. I find it relaxing and like seeing the project come to life, inch by inch. Thank you for this giveaway – it is absolutely gorgeous! LOVE the beautiful design and beautiful colors and would enjoy working with this. I adore counted cross stitch but enjoy needlepoint & crewel also. I learned my needle skills on crewel. I would love to venture to other forms of needlework which I may be able to try now that I have just retired. I love most types of embroidery though nowadays I mostly do counted cross stitch. I love the designs of crewel embroidery but prefer to stitch with cotton or silk rather than wool.I also love goldwork, stumpwork, and Elizabethan embroidery – really whatever I am doing at the time! I’m drawn to general surface embroidery. My moods change and I am just renewing my interest and experimenting with embroidery. Learning something new, keeping the brain active. My favorite type of embroidery is definitely satin stitch monograms right now. They are elegant and beautiful and just a pleasure to look at and touch. My second-favorite is the kind of crazy freeform flower effect that you did for the voided monogram. It’s so fun and whimsical and just makes me happy to look at it. Thank you! I love bead embroidery and surface embroidery, I love the freedom both types allow and the different design elements you can add in. Although I love any kind of stitching to be honest and will try anything as long as I can have a needle and thread I am happy. I haven’t done crewel work in years. A rusty needle in the first piece I began ashamed me into finishing it. A trip to France resulted in a purchase of a relatively large Bayeaux Tapestry kit — I was in & over my head quickly. Just as quickly I gave the kit to a REALLY talented needlewoman. The beauty of the Kashan crewel kit in your newsletter has drawn me to entering the drawing WITH a commitment to finish it (before a needle begins to rust). I like to cross stitch, and have done some basic redwork embroidery on a quilt, but would love to learn all the beautiful stitches in embroidery and crewel work. I enjoy all kinds of embroidery, especially crewel, since it is so beautiful and relaxing to stitch. This kit is lovely! Hope it finds it’s way to my home. I have been following Needlenthread, learning new stitches and making doodle clothes. I drool over the gorgeous work I see and wonder if I’ll ever create anything to compare. The last embroiderery project I did was to embroider my granddaughters name on her backpack underlined with grass and French knot flowers that gradually morphed into a butterfly made up of flowers I saw online. I think it would be so cool to have a kit to work, complete with wool thread which I’ve never worked with. Oh, that would keep me happy on winter days! I have done a lot of counted cross stitch over the years, but I am drawn to crewel work because of the colors and textures. I still have one of my first projects that was a koala bear sitting in a tree. I began work on that project when I was sitting at an airport ready to ship out to Korea when I was in the Air Force back in the 70s. My favorite embroidery is a free form use of traditional stitches to enhance and enrich my textile art. Crewel work will give me another set of techniques to add to my repertoire. I love cross stitch. I work on it while watching tv. It’s so relaxing! I’ve been fooling around with Sashiko stitching lately. Simple stitches. My favorite kind of embroidery is general surface embroidery. Endless options. I am a lace maker who has recently joined our local Embroidery Guild. I have done quite a bit of cross stitch, which I love, but am itching to try my hand at ‘real embroidery’. Where I am I would have to order online anything much more than DMC floss. So it would be lovely to have a whole kit, with threads and all. I mostly do Redwork these days but I like Cross stitch and just about everything. My favourite embroidery is crewel as so many slants can be placed on it, beads to embellish , a wide variety and interpretation of a range of stitches and thread and top of the list the opportunity to use an array of colours. I love whitework. You can do so much with just white thread on white fabric. I’ve also started doing some bead embroidery and I quite like it as well. Everything is so shiny! I enjoy alternating between Crewel Work and embroidery.Sometimes I have both projects on the go at the same time and I work on one at home and the other at work (great lunch time project). This is such a beautiful kit. Love the pink and green color combination. Here’s hoping I win. Wishing you all the best Mary. I’ve done crewel only once yet, but like it. Had to adjust working with wool since it is not the same as working with other kind of threads. I havent’t have time yet to try all the different kinds of embroidery but up to now, I think what I like best is whitework (but not always work in white though). May be I is because I like the precision, I like the cutworks which is part of some pieces. My favourite is what ever tickles my fancy at that particular moment, cross stitch, surface embroidery, applique. I like to experiment and learn new techniques and stitches. Your site is always a source of inspiration. challenges. I would love to have a kit that I could use to refine my love for embroidery and enjoy Talliaferro designs. The Kashan crewel kit is simply stunning, love the colors and the design! My favorite type of embroidery: I’ve come full circle, starting with Crewel eons ago, then both Whitework and Antique Samplers, now back to Crewel. Why? The new Crewel excites me, it is simply so creative with the use of non-traditional threads, vibrant colors, needle lace techniques. It provides learning opportunities and a great sense of accomplishment. Thank you, Mary, for your inspiring columns. I enjoy doing crewel work because I love learning new stitches I have not perfected yet to apply to my own artwork. Currently I am most enjoying general hand embroidery using the DMC floche threads you have described to us. I love color and to experiment with various stitches and subject matter. Budget has prevented me from getting into much crewel work, but I love stitching with wool, and again the variety of color and stitches that crewel work provides. The crewel work offered here would be SO much fun. I’ve just gotten back into needlework. Always enjoyed crewel work when I was younger and I’m looking forward to doing it again. I have yet to find a type of embroidery I do not love- I do them all. Surface embroidery of all kinds, pulled work, bobbin lace, Romanian lace, Drawn thread- they’re all so much fun. Crewel was my first venture, and always a favorite. I primarily do cross-stitch because it is so fool-proof. If one can count to ten (I grid my work surface in ten by ten stitch squares), stitching is so simple. One does not have to agonize about stitch spacing as in embroidery. The colors and textures of this illustration makes me want to try my hand at crewel embroidery again! I love traditional surface embroidery, and I would really like to try crewel embroidery. Cross stitch is still dear to me too because the simplicity of the technique makes it very relaxing! I am a crazy quilter, so the seam embellishment that entails is my favorite. I would have to say that canvas work is my first love but at the moment am doing crewel embroidery on wool with wool and am having a marvellous time. It is good to step out of your comfort zone from time to time. This embroidery give-a-way is so lovely and colourful I itch to give it a go. Je préfère le crewell, comme celui ci, bien coloré. c’est une telle détente.. que les soucis s’envolent lorsque l’on brode!!! I love surface embroidery, embroidery to embellish applique, and crewel embroidery. I’ve admired Stumpwork for years and just signed up for an e-class for that. I began with crewel years ago and then couldn’t really find it in my local stores. Delighted to see its return thanks to the information shared through your newsletter. It was my first embroidery love. I really enjoy Crewel Embroidery but with cotton thread not wool. The designs just make me happy. If you use cotton thread instead of wool, how many strands do you use? I’m a dabbler and have to say I enjoy general surface embroidery. Thanks Mary for your giveaway chance. It’s always fun to try my luck with these cutey kits. I bought the Late Harvest Kit and feel excited to start. I love freeform embroidery, where different techniques and motifs and materials come up freely and creatively. I’m now doing a small project on crewel embroidery, so it’s such a coincidence that Kashan kit giveaway comes along. Have many nice days, and a lot of beautiful stitches! Oh, this is just soooo beautiful! I have been embroidering for about 3 years, mostly free hand embroidery and some cross-stitching, and I’ve been wanting to try Crewel for a while now. Bought a few books on it and I just love the lusciousness of the wool… I also have an online “Jacobean Crewel Tapestry” book that I am dying to get into. Would love to start my crewel journey with this give-away. I’m a busy Mom of 2, and discovered I could still be social while embroidering at the same time! Family reunions, TV with the kids, just plain old “me time”, you’ll find me embroidering away. It has been a true godsend for my mental health, and I’m completely committed to it and to improving. As far as doing, I enjoy counted work the best. I think it’s because I have a definite spot to place my needle. But I really love a lot of the crewell designs I’ve seen and am actually working on a Phillapa Turnbill piece trying to expand my needle skills. Thank you Mary for the reviews on books and kits. They are very helpful and full of eye candy! I agree with others who cannot choose just one. I like surface embroidery, especially needle painting; crewel, and I’m eager to try goldwork. I also like to combine some applique with stitching. I am not a fan of counted-thread techniques that I have tried (needlepoint and cross-stitch), but I love the look of blackwork so I may have to give it a try someday. Crewel is my embroidery of choice, probably because I did a piece that was satisfactory to me years ago. I like the texture of crewel wool and the many stitches that can be used. I like Jacobean and Elizabethan motifs and some modern ones although it depends on the colours offered. I love the formality of this design with the play on traditional design elements together with the suggested colours. I would quite happily work this. my favorite type of needlework is general surface embroidery. But lately I’ve been learning how to do crewel work. I love to do embroidery. Lately I have been exploring blackwork which I have never done before now.I started needle work when I was young by doing crewel work. Our library had lots of books on the subjected thats what got me interested needlework. I enjoy quite a variety of needlework projects but my favourite is cross stitch. Just seeing the image materialise in either colour or silhouette is rewarding. I love so many embroidery types its a really hard question to answer. I’ve always wanted to do a crewel piece but was a little daunted by the work so have kept putting it on my list but never getting to it. I’d love to win this kit as then there would be no excuses not to try! My favourite choice of embroidery is surface embroidery, either crewel or DMC or a combination of the two. When I was a little girl my mother brought a crewel kit home for me to stitch. It was a little girl sitting on a rug, reading a big book to her dog and cat. I stitched it and loved it. I worked several larger kits, too, but then got into cross stitch for many years. Now I’ve started back with a vintage crewel kit I found and it feels good to be back with my first love. I’m also doing embroidery on flour sack towels. My favorite is crewel. I like to work with the wool and the way it looks. I really feel most relaxed with surface embroidery. Thanks Mary! So far I love general surface embroidery best, but I admit I have yet to try crewel work as supplies are difficult to find where I live. I would love to try all forms of embroidery, I just need a good project to get me started. There is so much to explore! I love general surface embroidery! I would appreciate a chance to win the crewel kit!! I do not have a favorite. Am trying to learn about as many types of embroidery as I can and think this is beautiful. Currently working on embellished embroidery. I have been working on a lot of counted cross stitch recently trying to finish up a couple of projects, but I think my favorite form of needlework is crewel. I am intrigued by stumpwork and love the look of crazy quilting, so I think I will try them out next. Perhaps my favorite embroidery is Russian punch, but I really love it all. I like reticello. There’s a lot of work, patience and precision involved but the results are worth it. I adore the lace-like effect it produces……so delicate and intricate and airy. Surface, Schawlm, and so on. Never tried Crewel do. But this kit is beautiful. Thelucky winner will have a great time stitching this kit. I love general surface embroidery. The floral voided monogram was right up my alley! I’d never be bored just embroidering flowers of all sorts, in all colors, with a variety of stitches! It feeds my passion for color, and keeps my creative juices flowing when I play with needle and floss! I’m just getting back into needlework, so I don’t have a favorite yet! I am working on a needlepoint cuff, and an embroidery sampler. I am also finishing one of my mom’s crewel projects from years ago that she never completed. I do enjoy working with wool and the variety of stitches, and would love to do another crewel project. The colors in the Kashan kit are stunning! Hi Mary, I have been receiving your emails for a long time and really look forward to when they enter my in-box. I am in awe of your expertise. This is the first time I have entered any your “give aways” as I live in Brisbane, Australia and understand the restrictions logistically. I have been mainly doing cross stitch for ever and love the results I get from the more intricate patterns – adding sead beads and trying the newer types of threads eg light effects. Over the last five years I have had 3 major back operations to keep my legs working and me out of a wheelchair (nothing like you have had to go through recently) and are now restricted in my movements. I have to do a lot more sitting and as I have been forced to retire from work I, therefore, have the time now to branch out in other forms of embroidery – l am currently trying to get a handle on brazilian and needle painting and you have been so helpful with the new stitches. I am enjoying the challenges in mastering all these stitches. I love working with kits as everything is at hand from the beginning and would love to try crewel work, so this kit would be a great start. I am willing to pay the postage if I was lucky enough to win. I have not done much embroidery before, so it is hard for me to say which is my favorite. I would love to when the giveaway kit to learn more embroidery. Up to this point, I really have only done cross stitch. I’m a weaver and I’m looking at creative ideas to enhance my handwoven linen and cotton towels with embroidery. Boy, do you provide inspiration!!!! I love embroidery and crewel work which I learned as a child. I have since learned to do needlepoint, hardanger, mountmellick, drawn thread work…. And quilting. I just love needlework!! I love crewel embroidery and how the designs can be both whimsical and elegant. The wool threads also seem quite forgiving! Surface embroidery projects are what tickle my fancy. I’m currenty limiting myself to embelishing practical gifts such as as dish towels, handkerchiefs, and baby blankets. I like the challenge of executing designs that will hold up to regular use. However, the crewel pieces you share have been tempting me to branch out. Mary, I am indebted to your tutorials for moving my embriodery interest from my head to a real needle. Your excellent videos are what make new stitches come alive fo me. Thank you for sharing your teaching skills with us. My first formal needlework class was crewel and no matter what new technique I learn, I find I am figuring out how I can use it in conjunction with surface stitching. It has been interesting over time to see how crewel designs have taken on a contemporary look and in using traditional techniques and materials creating totally new designs. It would be great fun to do this kit. I enjoy viewing and learning about all forms of embroidery and fibre arts. Most of them, however, are spectator sports for me, and I am happy to applaud the beautiful work of others. But I do play stumpwork at the amateur level, and surface embroidery strictly for my own pleasure – not competitively. Currently I’m a determined beginner in the arena of crewel embroidery – especially the Jacobean style. I like the historical context and working with the deep, rich colors of the wool. And at my stage in life, I appreciate the larger scale of crewel work. It’s fun to be learning something new, and to be spending some of my retirement money on new toys! I have found diversion and relaxation over the years in quilting, surface embroidery, needlepoint, cross stitch and black work. Recently, I’ve been curious about crewel, stump and gold work. The piece you are offering has such luscious colors and shapes. I think it would be a real joy to stitch. I am in love with Hardanger. White work is so elegant. I enjoy the precision of a counted work and the open look of the cut areas. It is really hard to choose as I do all types but if I have to pick one, I’d say needlepainting using long and short stitches first followed by crewel. Thanks for the chance of winning a lovely giveaway. Sorry, I forgot to say why I like needlepainting. The colors you create are so realistic and lifelike that it truely resembles painting. I enjoy general surface embroidery. I like what it can add to a block, when used in a complementary color. My favorite needlework to do is Hard anger because I love the lace-like look. I like embroidery, cross stitch is my favorite. Just recently i was looking into brazylian embroidery. Something new I would like to try. Thank you for the opportunity to win this beautiful kit. I would love to learn to do this form of embroidery it is so beautiful and colorful. I love crewel work probably the most because of the depth that the wool gives to the embroidery and I like working with it. Floss needs more fiddling with it but it is fun too. The colors in the kit are absolutely beautiful and the design is too. I’d love to win it. Thanks for the chance. I am in love with Whitework and in particular Hardanger. The precision of counting and the open look of the cut areas is so elegant. I really enjoy cross stitch. It is very relaxing. But I have been learning more surface embroidery lately and may have a new favorite. At this moment my favourite is crewel work! I like it so much! Crewel work is the first embroidery I learned to do. I really like the effect that it gives. Over the years I’ve come to like more regular surface embroidery because it’s just more diversified. No end of the choice of stitches. Dear Mary, as an aspeger, I normally like to explore new possibilities, I am curious about new ideas for embroidery that I can possibly do, so, I don´t have my favorite yet. Talliaferro designs and kits seem to be a good new challenge, something to mend my soul and make happy other adult autistic females too.